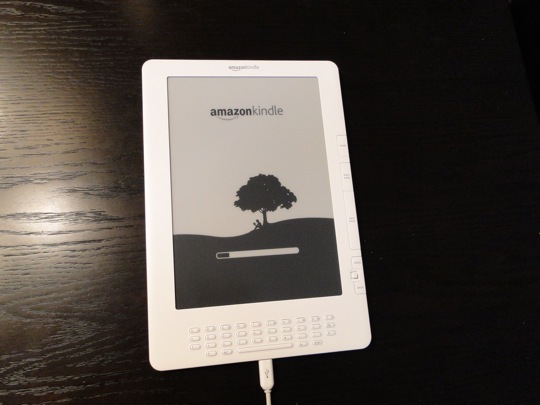 Another month, another version of the Kindle. I’ve been using a Kindle since it was shaped like a very thin doorstop and I’m delighted each time I see a new version. The latest version is the DX, a monstrous 9-inch version of the smaller Kindle 2 that supports direct PDF reading without conversion. Why am I interested in the Kindle? Well, I already have a first-gen Kindle so I’m not too keen on upgrading immediately. But I’ve been waiting for Amazon to solve something with the Kindle DX that has been nagging me for quite a while. You see, I have a problem. 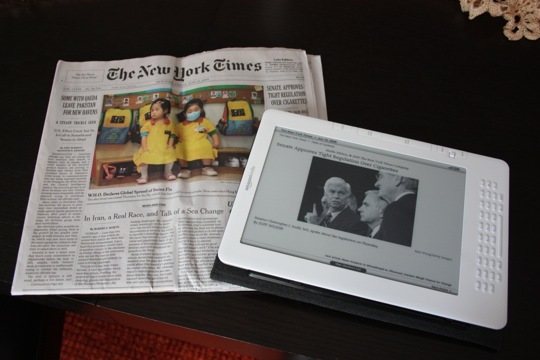 I don’t want to read the New York Times on paper anymore but paper seems like the only logical way to read it. Reading the newspaper on a gadget is rude and dangerous – especially with toddlers around the house. It’s a tough sell to have a gadget at the breakfast table. But then I know that I’ll never read it on the desktop whether through the Times Reader or any other source. So the DX sounded great. I has all of the features of the current Kindle plus rotational sensing and a beautiful, huge screen that might just fit the entire NYT front page and not just one article. So that’s why I wanted to see the DX. For context, here is what we said about the K2. We didn’t formally review it. The DX is basically a 9.7-inch reading device. 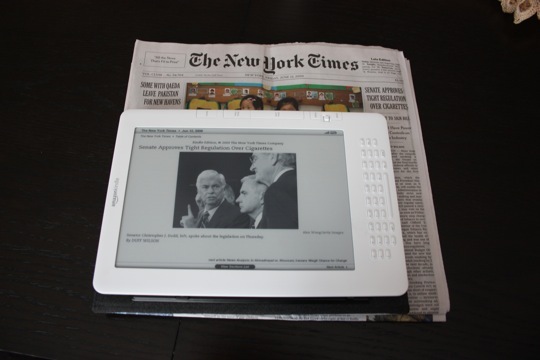 It has a small keyboard, navigation buttons only on the right side, and uses an improved version of the e-ink screen that displays gray scale with surprising fidelity. It has native PDF support and can store up to 3,500 books. It costs $489.00 and will be available next week. Like the original Kindle the device has a wireless feature that lets you download books over the air but you can also drag books – basically Amazon’s proprietary format – and PDFs right onto the device via USB. It can last for up to 4 days with wireless on. It also reads your books aloud to you, where applicable. Some publishers are selectively shutting this feature down. First the cons. The Kindle DX is heavy. It’s heavier than the original Kindle by over nine ounces. It’s not much, but clearly Mosso and I share a strange affliction called “Ouch, our wrists hurt holding this thing.” It’s a big device. It works best on a table. The second problem is the auto-rotation. If you move the Kindle a little too much in any direction, the screen rotates. It’s a good feature if you’re reading a newspaper or magazine, for example, but it’s not so good if you’re nodding off in bed. Now the pros. This thing is quite easy to read books on. Each page holds a multitude more words than the original devices and you rarely have to press the page buttons – there’s just more real estate. Images are crisp and clear and books can be viewed horizontally. Them there sure is a lot of words. The page size also makes for an easier read although all that grey does get tiring. This thing is good for heavy duty reading. The annotations and notes system is good for research as it drags the notes off of the book and onto an Amazon website – a huge plus for students and scholars. My original complaint with the Kindle 2 was that it wasn’t good for research. This model has remedied all of those concerns. Newspaper reading is a bit of sticking point. It is easier to browse stories on this larger screen and the nature of news stories allows many of them to fit on one or two pages as opposed to the endless parade of pages on the smaller Kindles. I’m going to be trying to read the paper on this for the next month and I’ll report back when I put the DX through those demanding paces. However, I understand that there are certain formatting considerations here that only updates to the software and hardware can fix. In short, this is a bigger Kindle. But is it the Kindle for you? 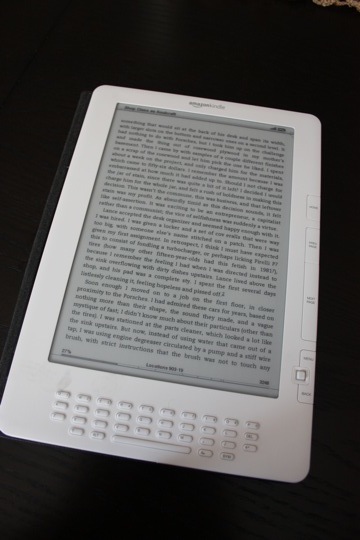 I’m convinced that the Kindle – as a brand – is the book reader to buy. Unless you’re into piracy, getting first run books onto any other reader is too convoluted and the UI and Kindle system is the best, hands down. I’ve used the Sony Reader and a few other e-readers and the Kindle is made for real readers i.e. people who read and want a seamless reading experience. If you like to read, get one. If you like to download PDFs and TXT files – say you’re a slash fiction fan – get something else. That said, the DX isn’t the Kindle for the average reader. The Kindle proper, a 6-inch model that is quite light and nice, is the best they offer. Anecdotally, here is the best metaphor I can come up with to the difference between the Kindle and the Kindle DX. When my buddy worked at Dairy Queen we used to go through the drive thru and order a Blizzard, a concoction of ice cream and candy and other stuff that would have put a horse into diabetic shock. But instead of making the Blizzard in the normal manner, our friend would drop in little treats like a whole brownie or five scoops of M&Ms. The Kindle is a regular Blizzard while the Kindle DX is my friend’s extra-packed Blizzard. It’s more of a good thing, and sometimes that can be bad. If you have a specific need for a bigger screen i.e. you’re doing doctoral research and intend to upload a lot of PDFs, get the DX. Otherwise, even if you’re a student reading textbooks and novels you’ll probably be better off with the smaller, cheaper model. It’s more portable and it has all of the same functions. As for price, I can’t help you. $500 is a lot for a Kindle. But this is the best e-reader out there. It’s a complex and unique tool. You pay for that complexity. And what about newspaper reading? The jury is still out. But we’re coming closer and closer to a paperless publishing industry and these are just baby steps along a long road.